The Kiss Collection is a highly innovative range of Occasional furniture designed and made to exacting standards. A versatile “mix and match” design, in European oak, is available in two distinctive designs. The Latte painted option with Caramel Oak tops brings a casual contemporary theme to any room and ideal when creating an eclectic mix of furniture styles. The Caramel Oak finish option will be comfortable in the most traditional of homes. The collection is meticulously manufactured with exquisite detail. On the factory floor a large part of our work is still carried out by hand, typified by the Kiss detail, which is both distinctive and essential to the strength and construction to the furniture. 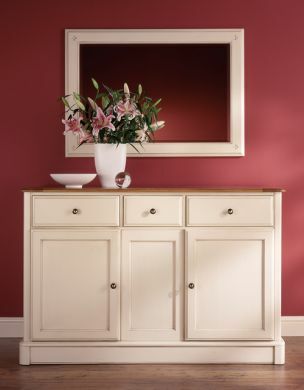 The rich caramel stain enhances the natural beauty of the Oak grain and is complimented by the Latte ivory painted finish, which is lightly distressed with an aged patina. Both colours are then sealed with a clear hardwearing lacquer finish.